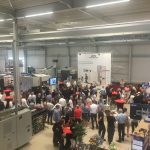 It’s almost five years after introduction of the revolutionary Cellro Xcelerate, a compact, versatile and easy-to-use solution to automatically load and unload CNC machines. 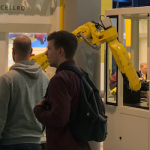 Now, the Dutch automation developer introduces its big brother: the Cellro Elevate. Adhering to the same modular design philosophy as Xcelerate, “Elevate” pushes the envelope by allowing for heavier products, vastly increased storage space and the option to operate at two machines at the same time. 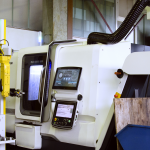 In similar fashion to Xcelerate, Elevate is placed alongside a CNC-machine in order to handle products and/or fixtures. The newest – and tallest – member of the Cellro family is compatible with many of the same modules, such as the Collet Exchange and Fixture Exchange, making the system freely adjustable to the user’s needs – right at launch. Elevate builds upon many existing Cellro technologies, uniting them in a standardized system. Towering at three to four meters in height, Elevate generates a really impressive amount of storage space, allowing for up to 28 trays of products. This adds up to a staggering amount of 14 m2 storage capacity. Yet, the entire system has a footprint of merely 2,8m2 to 5m2, depending on the selected frame and robot. Elevate is available in varying width and heights. As space is scarce at many production floors, Elevates tall and slim posture makes it easy to integrate the system on your current shop floor. The optional modules Fixture Exchange and Collet Exchange enable the user to benefit from this storage space even further, by combining multiple series completely unmanned. The Smart Storage system, which adapts the height of the stored trays to the height of the stored products, further helps in utilizing storage capacity as efficiently as possible. Both by minimizing wasted space and cutting down the travel time between machine and tray as short as possible. Further, Elevate parks the active tray in front of the robot and continues doing other tasks while the robot works form this “parked” tray. In that way, there is no time wasted. Also, the system is endowed with a range of Fanuc® robots, more powerful than Xcelerate. The options start at the Elevate E20, handling 20kg – all the way up to the Elevate E70, which has a maximum robot payload of 70kg. Before its official launch, the first Elevate system has already been sold and is currently being prepared for operation. Those who want to experience the benefits of Elevate firsthand are warmly invited to visit the Cellro booth at the upcoming AMB (September 18-22 2018). 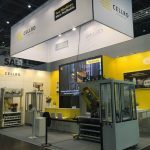 Here, Cellro will showcase the 1.6m x 4m model alongside two demo machines. Visitors will get a clear grasp of Elevates efficiency in product storage while multitasking across multiple machines. Next post What are the advantages of the robot grippers and fingers for Xcelerate users? 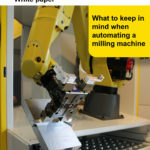 Download your white paper about automating a milling machine now!